In the visual arts, urban landscape is an artistic representation, such as a painting, drawing, print, or photograph, of the physical aspects of a city or urban area. In urban design, the term refers to the configuration of built forms and interstitial space. From the first century A.D. dates a fresco at the Baths of Trajan in Rome depicting a bird's eye view of an ancient city. In the Middle Ages, urban landscapes appeared as backgrounds for portraits and biblical themes. From the 16th through 18th centuries numerous copperplate prints and etchings were made showing cities from above, to function as map-like overviews. Halfway through the 17th century the cityscape became an independent genre. At the end of the 19th century the impressionists focused on the atmosphere and dynamics of everyday life in the city. Suburban and industrial areas, building sites and railway yards also became subjects for cityscapes. During the 20th century attention became focused on abstract and conceptual art, and thus the production of urban landscapes declined. 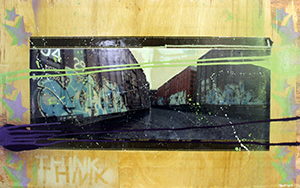 Contemporary urban landscapes include abstract and conceptual art, digital photography, and more. Pieces capture the atmosphere and dynamics of everyday life in or around an urban setting as well as reflect the themes of urban landscapes, such as how we relate to the places we live and their impact on our sense of space and place.